Americans love meat, and for good reason: meat is delicious. So very, very delicious. Just one problem: our national and increasingly global meat addiction is going to destroy us as a species if we don’t find a way to rein it in. Is the feedlot system itself sustainable? That is, can we keep stuffing animals—not just cows but also chickens and pigs—into confinements and feeding them gargantuan amounts of corn and soybeans? And can other countries mimic that path, as China is currently? The answer, plainly, is no, according to the eminent ecologist Vaclav Smil in a 2014 paper. 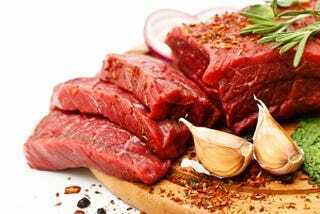 Smil notes that global meat production has risen from less than 55 million tons in 1950 to more than 300 million tons in 2010—a nearly six-fold increase in 60 years. “But this has been a rather costly achievement because mass-scale meat production is one of the most environmentally burdensome activities,” he writes, and then proceeds to list off the problems: it requires a large-scale shift from diversified farmland and rainforests to “monocultures of animal feed,” which triggered massive soil erosion, carbon emissions, and coastal “dead zones” fed by fertilizer runoff. Also, concentrating animals tightly together produces “huge volumes of waste,” more than can be recycled into nearby farmland, creating noxious air and water pollution. Moreover, it’s “inherently inefficient” to feed edible grains to farm animals, when we could just eat the grain, Smil adds. In addition, the necessary scaling up of meat production and consumption—from 300 million tons in 2010 to a predicted 500 million by 2050—shows a system headed towards a massive implosion. In short, the continuation of the feedlot system will ultimately lead inexorably to ecological disaster. As someone who desperately loves eating meat wrapped in meat marinated in various iterations of meat, I’m not thrilled by this news. Not acknowledging that the problem is real at this point, however, is patently insane—and dangerous. So what do we do about it? Obviously, “everyone needs to just stop eating meat entirely,” which is somehow something people say with a straight face, is a laughably unrealistic non-starter—not to mention ordinarily accompanied by a level of insufferable sanctimony that makes non-vegetarians want to mainline bacon grease out of spite. But as we’ve seen above, we can’t continue along our current path. The simple truth is that if we want to dodge disaster, the developed world is going to have to cut back heavily on meat consumption. Some of this appears to already be happening, at least on a small scale: while global meat consumption is rising, US meat consumption has actually been slowly but surely lagging for years, from a peak of 9.5 billion animals in 2009 to a somewhat more modest 9.1 billion recently. Since all available data indicates the number of vegetarians/vegans hasn’t really gone up in the interval, the only conclusion is that Americans are actively choosing to eat less meat. But the other problem is the last thing the factory farm system and its major corporate entities want is for us to cut back. They’re operating off the same short-term profit model as do all other US industries, where the watchword is to slash and burn and make as much as you can without thought or regard for the consequences—and this profit motive is something vast swaths of society treat as laudable rather than dangerously irresponsible. Plainly, they’re going to do everything possible to keep pushing their product, especially in developing countries, which is where the greatest increase is going to come from. We can choose to continue to cut back (and we should), but will everyone else? I’d like to believe so, but I’m dubious. Philpott seems convinced that the impending doom will force us all to act like responsible, reasonable adults lest we royally screw ourselves (his piece, after all, is titled “We’ll All Eat Less Meat Soon—Like It Or Not”). I, on the other hand, tend to take the view that human beings, and Americans in particular, are such fervent disciples of the Church of Denial as to actually believe a problem staring them in the face isn’t real. Humans often have a singularly terrible inability to think about long-term gain at the expense of short-term pleasure, and I don’t see how this issue is any different. Sure, eventually we’re going to have to stop eating meat—but only after the inevitable environmental cataclysm when we’re all living in a Mad Max-esque wasteland. I don’t see anything that leaves me hopeful we’ll stop before we hit that point. What hope we do have might lie not with reducing global meat consumption, but by making it more sustainable. The answer as to how likely lies with synthetic meat. The environmental footprint of in vitro meat is practically nothing when compared to other forms of meat production, and as an added bonus, no one can complain about the cruelty inherent in its production. * While lab-grown meat is currently cost-prohibitive, the hope is that advances in technology will render it viable in 10-20 years; hopefully, we’ll be seeing it by the late 2020’s. Hopefully, the advent of synthetic meat, along with a continuation of the current trend of cutbacks in the developed world, would help solve the issue—because beyond that, I’m not sure what we’re going to do to stave off ecological devastation.